At first glance, the four-legged creature above might seem like an otter or a platypus. But in fact, it’s an ancient, 13-foot-long whale that lived 42.6 million years ago. Named Peregocetus pacificus, which means “the traveling whale that reached the Pacific” in Latin, this recent finding is upending scientists’ understanding of how these creatures evolved and spread around the world millions of years ago. “This is the first indisputable record of a quadrupedal whale skeleton for the whole Pacific Ocean,” study co-author Olivier Lambert said in a press release. Peregocetus had four legs, with small hooves of the tips of its fingers and toes. That adaption, along with the orientation of its hip and leg bones, suggests this whale ancestor could maneuver on land. Its tail and webbed feet, however, indicate that Peregocetus could swim well, too, much in the same way modern-day otters do. So Lambert and his colleagues categorized the creature as amphibious (meaning it lived partially in water and partially on land). But that doesn’t mean the animal was good at walking, and “certainly not at running,” according to the Los Angeles Times. It likely ate in the water and only took to solid ground for activities like breeding and giving birth, Lambert told the LA Times. Excavation of the skeleton of Peregocetus in Playa Media Luna. Paleontologists uncovered the animal’s bones just inland of Peru’s western coast at a site called Playa Media Luna, a three-hour drive south of Lima. They excavated the whale’s tail vertebrae, jaw bones, some of its spine, and its front and hind limbs. The animal’s skeleton suggests it was just over 13 feet long, and there’s evidence it had a pronounced snout filled with sharp teeth for chomping on fish. Peregocetus‘ tail bones appear similar to those of beavers and otters, suggesting that the limb played a large role in swimming, the authors wrote. Unfortunately, the bones from the tip of Peregocetus’ tail were missing, so the researchers weren’t able to determine whether it had a well-developed tail fluke (like modern whales have) to help propel it through the water. The left half of Peregocetus’s left mandible. Scientists agree that today’s massive, flippered whales evolved from small, four-legged ancestors in south Asia more than 50 million years ago. Fossils from one of the oldest quadrupedal whales that lived 53 million years ago were discovered in India. The ancient creatures likely migrated west from Asia to Africa, and then swam across the Atlantic until they hit the shores of the Americas. Until now, paleontologists thought these ancient whales had only made it to North America, and hadn’t strayed south. This is the first time a whale ancestor with four legs has been found in South America. 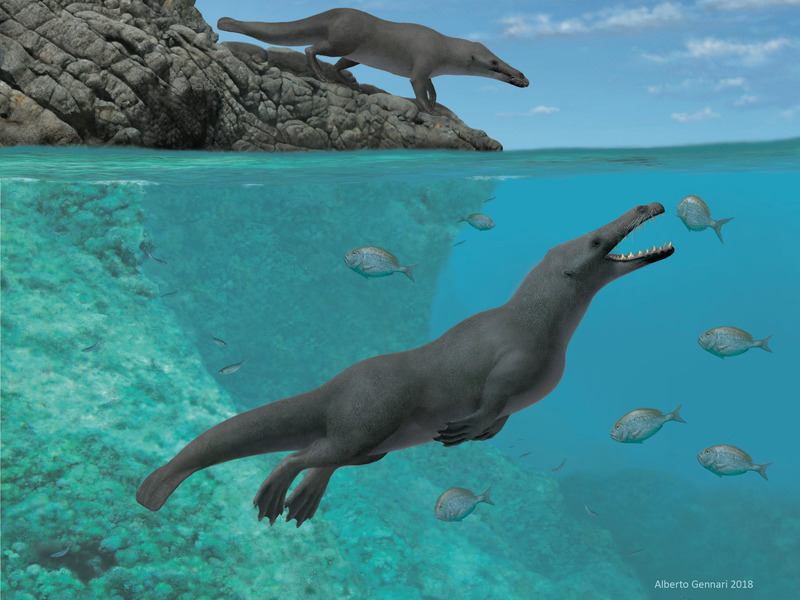 And according to the study authors, Peregocetus might also be the oldest quadrupedal whale found in the Americas. Whale ancestors with four legs are ample in the North American fossil record. Researchers found a 41.2 million-year-old whale ancestor off the shores of South Carolina in 2014. This led scientists to hypothesize that amphibious whales likely reached North America after leaving Africa’s western shores. But discovery of Peregocetus — which is 1.4 million years older than the South Carolina fossil — in Peru suggests that the animal may actually have arrived in South America before spreading to North America. Schematic drawings depict the skeleton of Peregocetus in walking and swimming stance. Solid lines indicate the main preserved bones, while dotted lines indicate reconstructed parts. So the study authors suggest that, contrary to previous ideas, Peregocetus and other whale ancestors likely traveled from Africa to South America. The distance between those was far smaller during the era in which Peregocetus lived — a period called the middle Eocene — than it is today. At the time, the distance between South America and Africa was about half of what it is today. During the Eocene, North and South America were also separated by ocean, which created a channel from the Atlantic to the Pacific Ocean. So the researchers now think that four-legged whales sliced through this gap between the Americas, then traveled north.